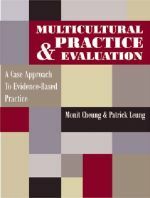 Multicultural Practice and Evaluation addresses the growing imperative for multicultural awareness in the helping professions. This book provides innovative strategies to assimilate practice theories to diverse family structures from a variety of cultural backgrounds. The text emphasizes evidence-based practices and provides counseling dialogues for role-play, evaluation methods, and topics for discussion. It highlights applicable techniques in each chapter, using a standardized case throughout, to provide therapeutic demonstrations of how theories are put into action. By applying multiple theories to a single practice example, the text facilitates a holistic practice–evaluation perspective. By varying the racial background and family structure of the case example, the practice–evaluation approach will give students the tools necessary to assess the efficacy of an approach tailored for each specific family structure.